I love strawberries. Absolutely. Oh, and how I adore mangoes too. Yum. If you love/adore/worship/admire/craze over these two fruits as much as I do, read on. You will love this marriage between strawberries and mangoes so much, that you’ll probably be overwhelmed with joy and start weeping. Okay I’m kidding. Don’t take me too seriously. Really. I’m getting a teeny weeny little bit high over the events that happened today, but I’ll spare you the details. 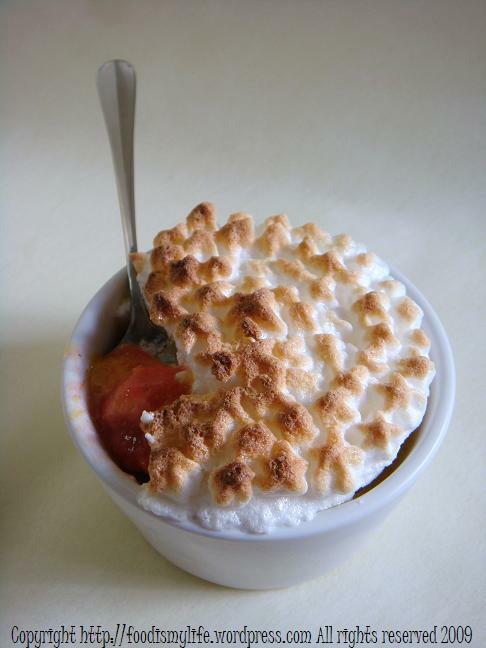 Strawberry-Mango Alaska – that’s what I was preparing yesterday. I actually have friends over my house today, so when I was looking for a dessert recipe yesterday, I was searching for a cooling and light dessert to counter the unbearable summer heat. This recipe is obtained from a book, which compiled all the recipes featured by Food and Wine in 2005. Instead of strawberries, raspberries are supposed to bu used instead. However, in Singapore, raspberries are extremely hard to come by. One small box of raspberries of 250 grams will already cost you S$7++! So being a poor student with no real income, I have to seek strawberries as substitutes. I puréed the strawberries yesterday and got them to coat some Savoiardi biscuits before topping with a giant scoop of mango sorbet. Then I let them sit in the freezer overnight before piping meringue on top and then freeze them for a further 3 hours after which I broil them for a while. Honestly speaking, I’m not a very big fan of meringue. I could have eaten this dessert just with the strawberries and mango sorbet but I decided to continue on with the recipe to give this dessert a more classy look. This time, the meringue ain’t too sweet, so it’s actually a pretty good balance between the sweet mango sorbet and the sweetened strawberry purée, much to my surprise. This lovely dessert has to be prepared ahead of time but that’s exactly what makes it a perfect dessert for parties and gathering. All you need to do is just get them under the broiler for a few minutes and they are done! Preparing this dessert in little cups like this also reduce all the fuss in cutting and transferring onto plates and stuff. Just get a spoon… and wait no longer to dig into the sweet, light and cooling dessert! Process the strawberries in a food processor with 1 tablespoon of sugar. Strain the mixture through a fine sieve, pressing the puréed strawberries through the sieve with the back of a spoon. Cut the Savoiardi biscuits into sizes that will fit the bottom of 4 small oven-proof ramekins (I cut mine into 4 pieces per biscuit). Coat the Savoiardi biscuits in the puréed strawberries and place them on the bottom of the ramekins, one biscuit per ramekin. Divide the remaining puréed strawberries among the four ramekins. Set aside for 10 to 15 minutes for the biscuits to soften. 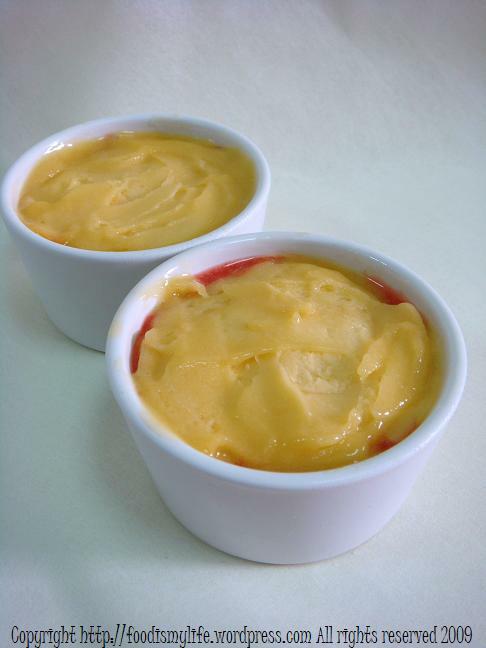 Scoop 1/4 cup of mango sorbet into each ramekin and spread evenly. 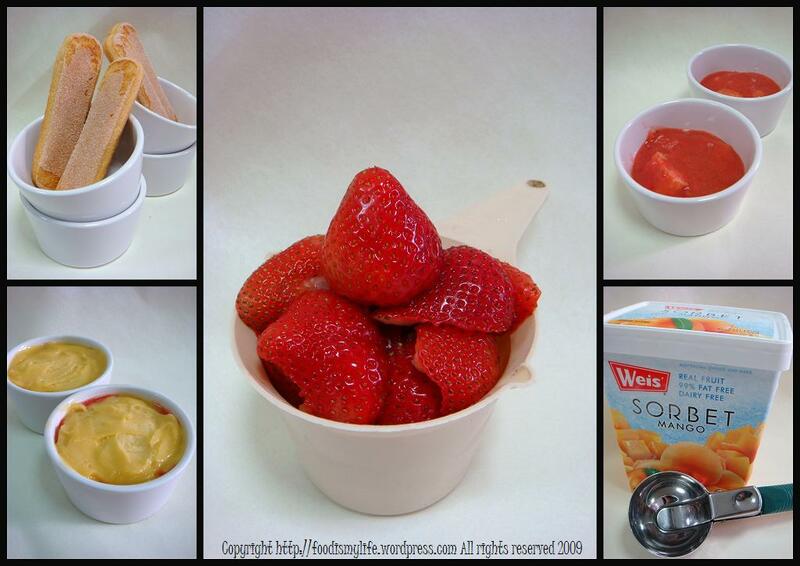 Cover the surface of the ramekins with plastic wrap and freeze the strawberry-mango for at least 30 minutes. 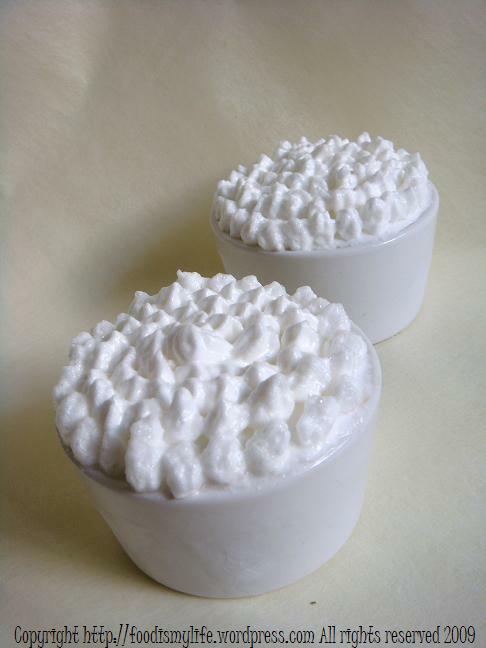 Meanwhile, whip the egg whites with a pinch of salt, using an electric mixer on low speed till foamy. Add in 1 tablespoon of sugar and continue whipping until peaks form. Add in the last tablespoon of sugar and whip until white and glossy. 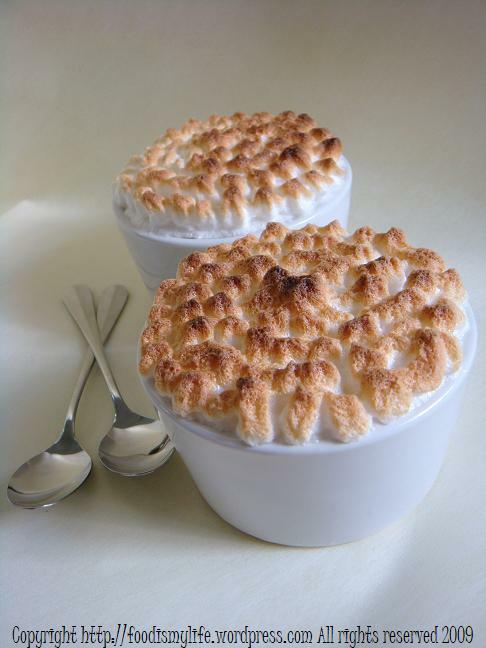 Remove the plastic wrap from the ramekins and pipe/spread the meringue on top of the sorbet, sealing completely. Return back to freezer to freeze for at least 3 hours. When ready to serve, preheat the broiler (or 200 to 250 degrees Celsius). Broil the alakas 5 inches away from the heat source until the meringue has browned evenly.Watch the alakas if you’re using a broiler, the meringue gets burnt very easily. Alternatively, use a blowtorch. *Dip your ice-cream scoop into hot water to make life easier when scooping the sorbet. Likewise, do the same when you’re spreading the sorbet.